Fringe NYC is like a basket of apples: Some may be sour and bitter, while others may be sweet and ripe. You never know what you’re truly going to get. Luckily, In Loco Parentis is a sweet pick. When a teacher is forced to help a student after-school due to an uncomfortable subject brought up during class, they become closer, inciting rumors that may or may not be true. Even before the play was over, I knew it was excellent. The lines are quirky and funny at some points, and meaningful the next. The conversation between characters are true to the play and the time - so much so that I can picture people I know saying the same thing. For example, one of my favorite characters, the teacher, Mr. Browning, is definitely a cross between the TV character House and my own English teacher. The characters have their own personality - they aren't two-dimension - and the acting is a treat to watch. The plot is refreshing. How many plays do you know show the taboo of a teacher-student relationship circled around college, death and Hamlet? Whether you like the play or not, by the end, you will step out of the theatre with a better knowledge of Hamlet. 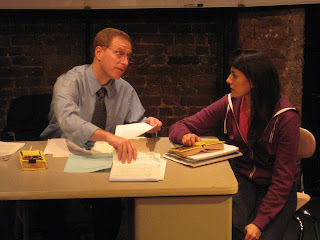 In Loco Parentis is a must-see, two-thumbs-up show. Every second is worth watching.